VideoGIF for Mac is a powerful and easy-to-use GIF maker for creating funny GIFs by trimming any part from a video/movie. 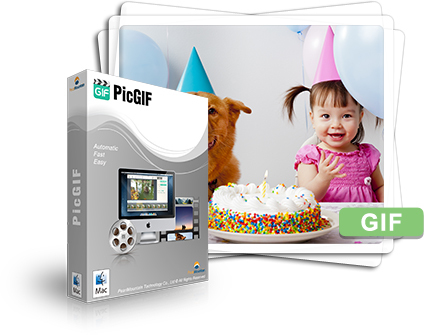 The video to GIF converter allows you to quickly and easily transfer any video clip to smooth and animated GIFs. PicGIF for Mac allows you to easily convert continuous snapshots and short videos into animated GIFs in a matter of minutes. It also comes as a handy use for re-editing and fine-tuning existing GIFs. It's easy to use, easy to save, and easy to share with the world! How to add videos from Webcam/video files to create animated GIF? How to crop the video clip to make it fit well? How to adjust colors for your GIF? How to adjust frame order to make a better GIF? How to insert and customize text/sticker? How to manage overlays of text/sticker?